In September, Ben Harris, head of investor relations for Origin Investments, shared the approach that enabled Origin to raise over $4M of capital online in a single week. Ben walked through the keys to building trust with investor’s online and aligning interest with investment partners. However, what resonated with me most, was Origin’s focus on the ‘long game’. When investing in private real estate deals, investors are often making a 10-year commitment, and sometimes longer. With that time-horizon in mind, the integrity of the people you’re investing with far outweighs the fundamentals of the submarket or the intricacies of the value-add strategy. Since publishing that post, Origin has set a new bar, successfully raised $10.6M in a single week! There’s no secret to their capital raising success, it’s a result of years of over-delivering, transparency, and hard work. However, there are some best practices that you too can use to establish trust and raise capital from investors online. In the highly anticipated Part 2, Ben discusses some of the other principles which define Origin’s fundraising success. How did Origin transition from a traditional private equity real estate firm into a market leader in attracting high net worth investors online? 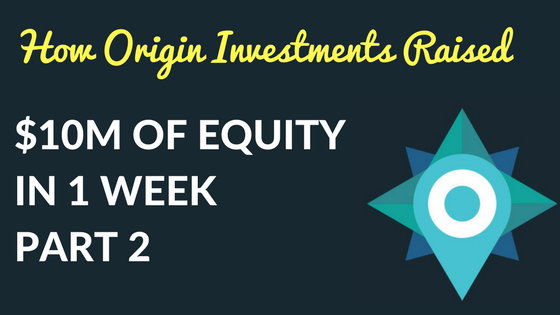 Origin’s Funds I and II in 2011 and 2013 respectively had $500,000 minimums. Given their success (both are on track to return an average net IRR of 24% and are in the top quartile of Preqin’s most recently ranked funds), we decided to make our institutional investment more attractive to a larger pool of high net worth investors. To do so, we reduced our Fund III minimum to $100,000 and marketed it nationally using an online platform and capital raising program. Last fall, as a result of our new efforts, we raised $4.4 million in one week from 16 new high net worth investors. But our fundraising for Origin Fund III has come a long way since then. Now we’re proud to announce that our new benchmark is 48 new partners in one week, totaling $10.6 million in equity. 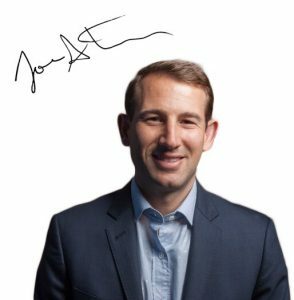 To date, Fund III has received more than $110 million in signed commitments from hundreds of investors, and we are confident our marketing efforts will continue to drive the fund size higher. The first step in successful marketing comes from an in-depth understanding of your target audience. What keeps them up at night? What problems do they have that your investment opportunity solves? There are thousands of potential investors searching the internet for answers to their investment questions. The best way to attract and connect with them is by offering clear, concise educational content that speaks to their pain points. Many investors are still new to private real estate investing and recognizing a strong opportunity from a weak one can seem overwhelming or monumental. Smart firms will make this process more digestible through instructive content that helps them understand how to navigate the complicated investing world. Our most popular blog post explains the difference between the internal rate of return (IRR) and the equity multiple, and is not focused on Origin Investments at all. We wrote it because prospective investors were asking us to explain the difference between the two concepts and we realized many could benefit from this blog. There is no shortage of private equity real estate investment opportunities online today; investors register on multiple platforms to review their options. But when you invest the time to create helpful educational content for your target audience, you will get their attention and show them that you are there to help as well. The right content will help attract your target audience, but ultimately an investor will choose to partner with your firm based on your branding. It plays a major role in the decision-making process because it defines why you’re in business, what you stand for and how you plan on delivering results to your investors. At Origin, we have three fundamental beliefs: It’s extremely important to be aligned with our investors; we must clearly communicate the full scope of every investment opportunity; and investors must receive timely and fully transparent investment updates. To fulfill these values, our principals are our biggest investors; we offer full disclosure on our fund fees; and we keep investors updated in near real-time through our investment portal. We use this brand positioning on our website, in our content and in our campaigns. It not only sets us apart from other firms, it serves as a strong promise to our investors. We also keep our brand in mind when we choose our partners, and expect them to share our ethics and values. 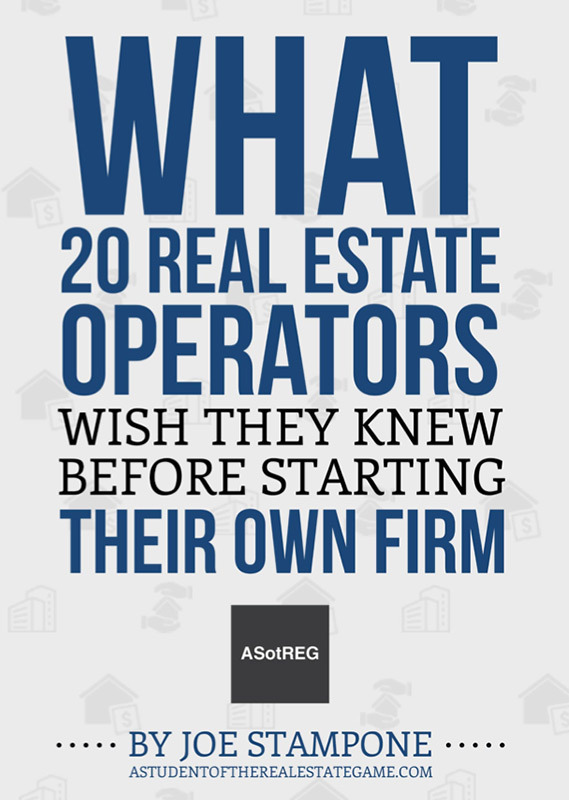 We are contributing to ASotREG for that reason; we appreciate the work that Joe does to educate thousands of people about the real estate industry. Once you educate your audience and build a brand worthy of consideration, how do you convert interested people into loyal investment partners? At Origin, we think the key is to go beyond digital. An individual may find you online, but the investment process shouldn’t stay there. Investors trust you with the wealth they worked long and hard to accumulate. This is a trust that hinges on personal relationships. We strongly believe investment decisions should be executed offline—and make it impossible for investors to complete the entire investment process online. Phone conversations are great, but face-to-face interaction is always best. We are headquartered in Chicago, but whenever possible we visit our investment partners on their home turf. The amount of capital Origin is raising online is crazy, but not surprising to me. It’s the confluence of years of effort and success, new regulation, and a great team to execute their strategy. Even if you’re just starting out, you can replicate the ‘Origin Approach’ to capital raising. Be patient and play the ‘long game’.